AKA Robert Earl Davis, Jr.
Houston-based Dirty South DJ, best known for his eponymous "Chopped and Screwed" mixtapes, where he would slow down records to half their normal speed and cut between two of the same recording, a laidback sound made ostensibly to complement the intoxicating effect of cough syrup mixed with soda. In the late 1990s, DJ Screw made hundreds of mixtapes using this technique, selling them out of the trunk of his car until demand grew so large that he opened a storefront. He gained a loyal following in his hometown and abroad, only to die of a heart attack (reportedly his fifth) at his studio. 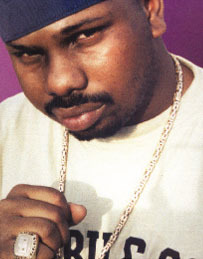 DJ Screw's influence has persisted to the present day. Chopping and screwing has become a fine way to pay tribute to good music, and indeed a compositional technique in its own right. Despite the trivial description, screwing music well is not as easy as it sounds, and his legacy reveals him as both an innovator and a musical talent. Father: Robert Earl Davis, Sr.